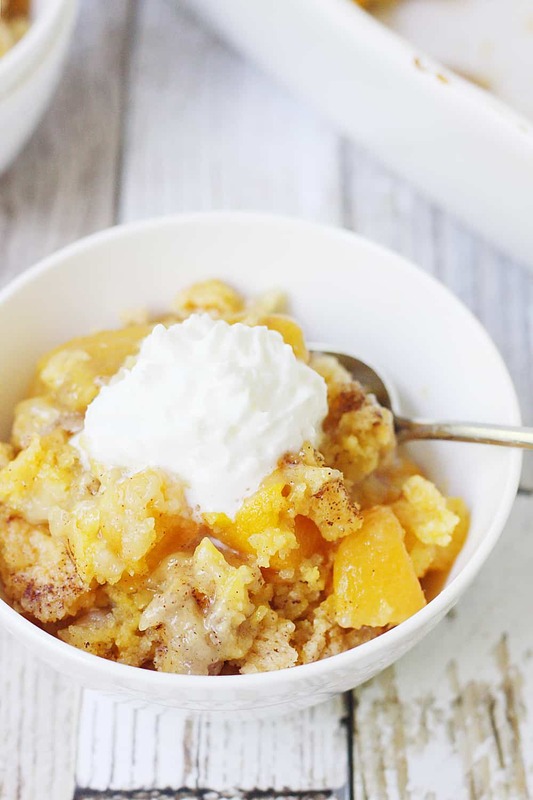 Easy peach cobbler dump cake is sure to become a summer staple! 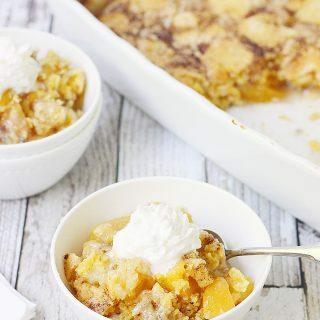 This mouthwatering peach cobbler recipe requires only four ingredients and five minutes of prep! 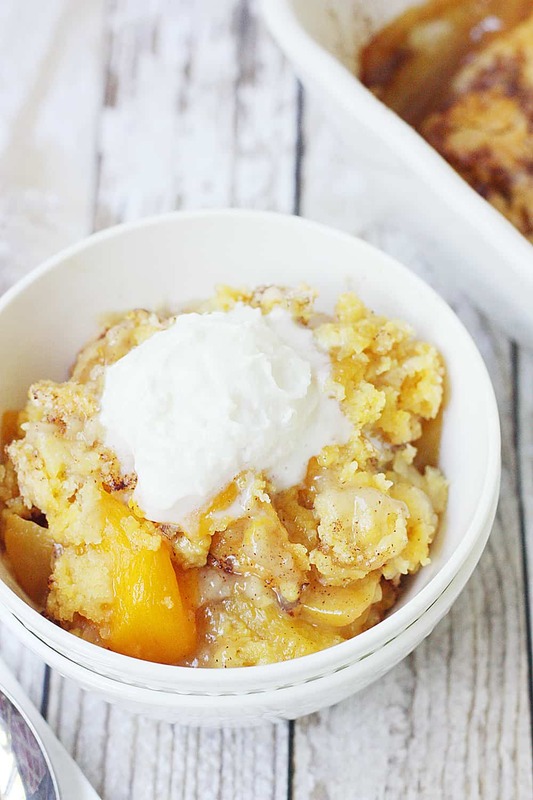 This easy peach cobbler dump cake is another one of those amazing doctored cake mix recipes. 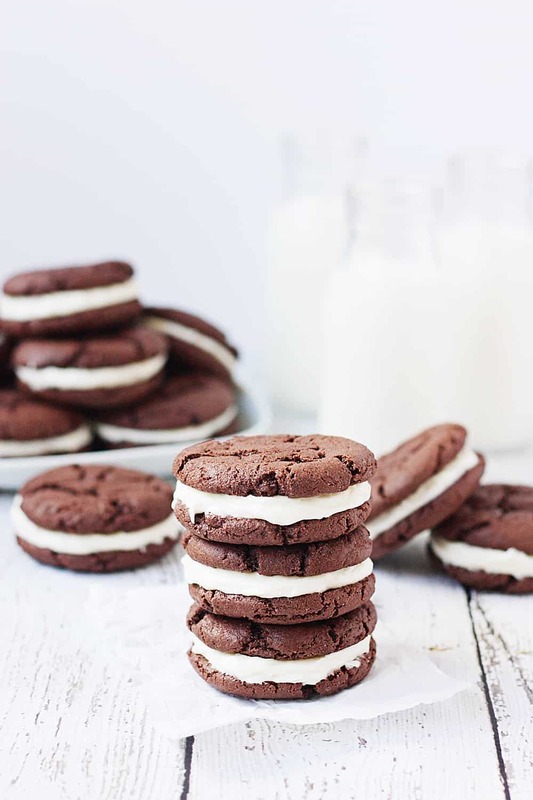 I love using cake mix as a base for all kinds of yummy desserts! Some of my favorites include these mini funfetti donuts, cake mix coffee cake, and everyone’s favorite cake mix Oreo cookies. For Lauren’s graduation, we hosted a sundae bar, but I knew I wanted more than Texas sheet cake as an option to pair with vanilla ice cream. That’s where easy peach cobbler dump cake comes in… or easy peach cobbler with cake mix if you want to get super specific. And super delicious. 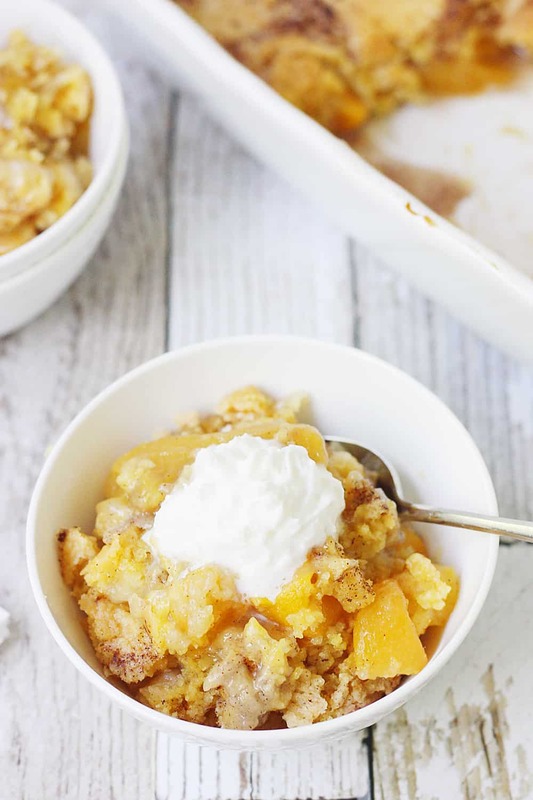 If you don’t count the vanilla ice cream, this easy peach cobbler dump cake requires only four ingredients: canned peaches, cake mix (this yellow cake mix is my fave), butter, and cinnamon. That’s it! I guess it’s not that hard to believe those four simple ingredients can make such a wonderfully scrumptious dessert. I mean, we’re talking PEACHES and CAKE combined with BUTTER and CINNAMON. 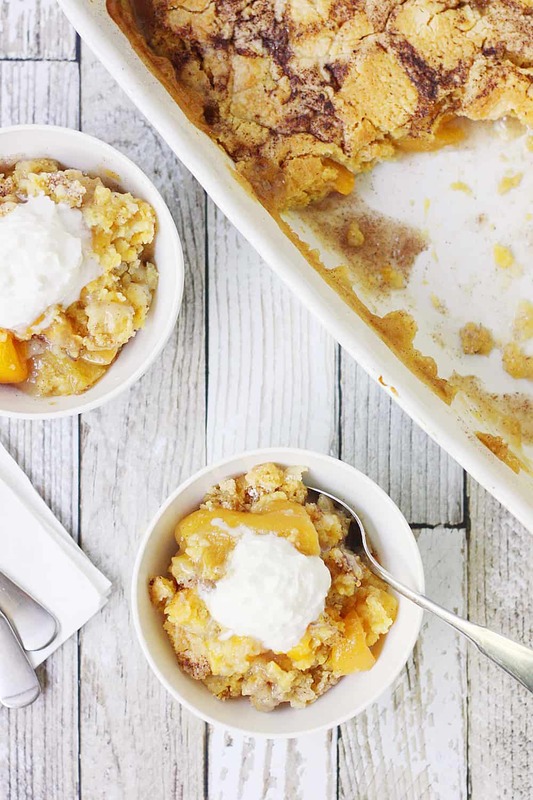 One version of this peach cobbler with cake mix has you melting the butter and drizzling it all over the cake mix. I prefer thinly slicing the butter and placing those pats of buttery goodness all over the top. If you slice the butter thinly, you can pretty much cover the entire surface of the cake. No matter how you slice it (see what I did there? 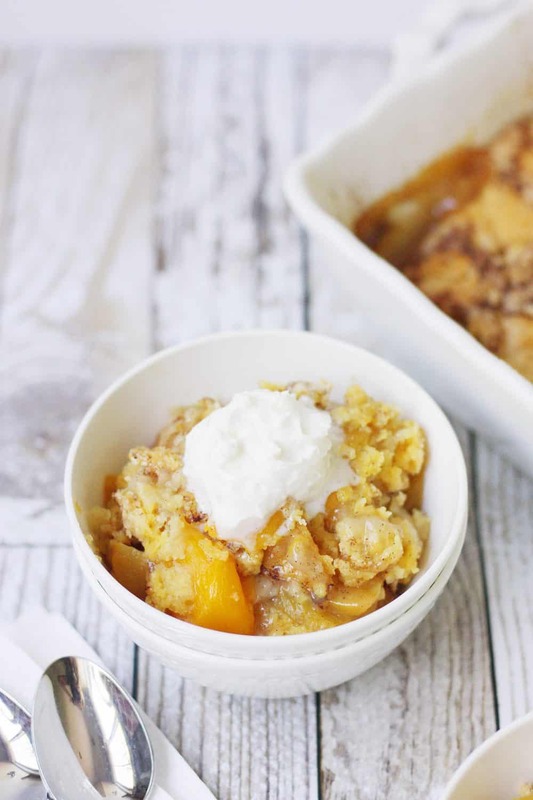 ), this easy peach cobbler dump cake needs to become a summer potluck staple. 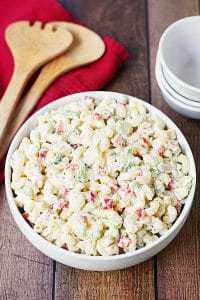 And because you use canned peaches, it can also become a fall, winter, and spring potluck staple. Yay! Preheat oven to 350 degrees. Empty canned peaches (do NOT drain!) into a 9x13-inch baking pan. Cover with dry cake mix; firmly press down cake mix. Cut butter into thin slices and place on top of cake mix. Sprinkle with cinnamon. Bake for 45 minutes. Serve warm or allow to cool before serving. 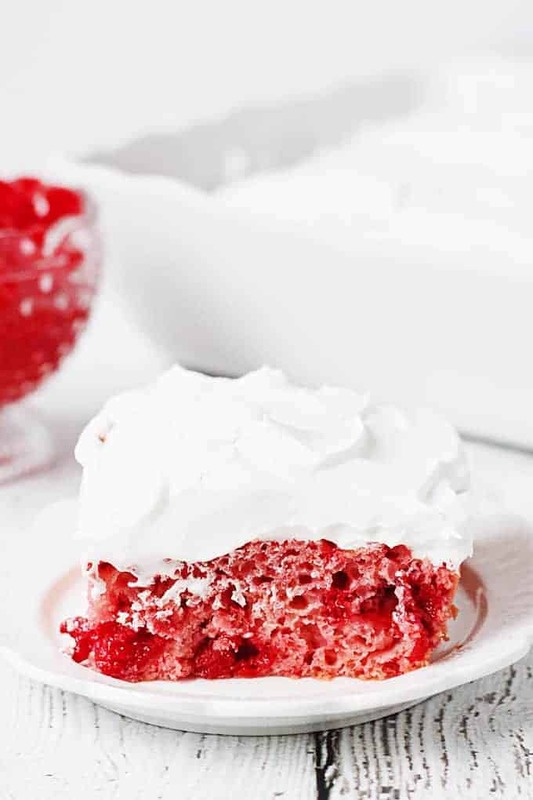 Top with vanilla ice cream or whipped cream. I’m not sure how it would work since you use the liquid in the canned peaches to mix with the cake mix. Without that liquid, the cake mix would probably come out dry. Sorry! I love peaches and this looks SO good! Dump cakes are so fun to make! 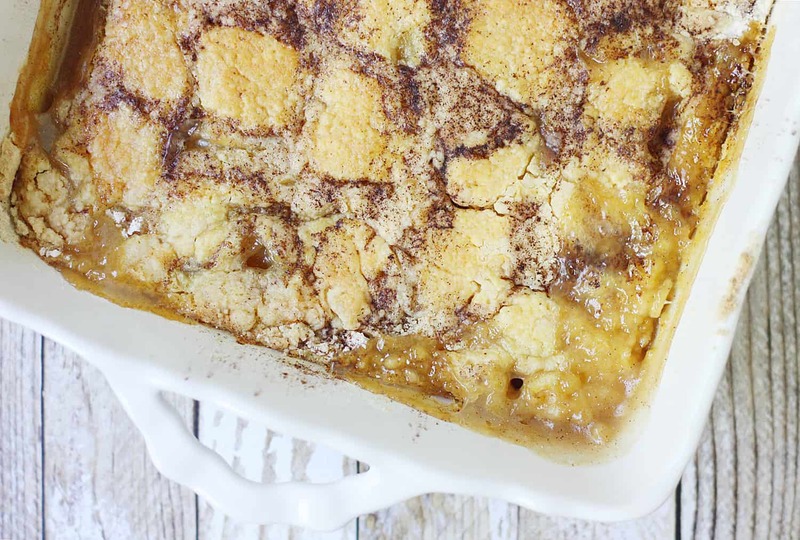 This peach cobbler looks delicious! 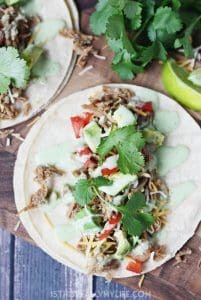 They are super fun to make, especially with kids! This looks SO delicious! 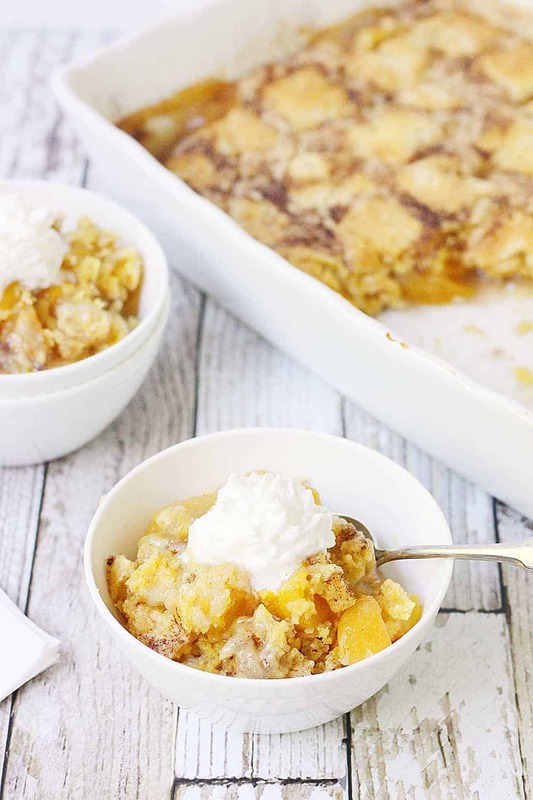 I have lots of peaches at my house right now so this is the perfect way to use them up! Yum! 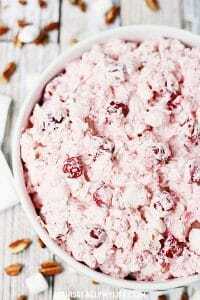 I’m always looking for easy dessert recipes. I can’t wait to try it this week! If you do try it, I hope you like it! Oh my, that sounds really yummy. Let me know how it goes! I haven’t tried it that way yet but I’ve wanted to. I did see a similar recipe calling for two 21-ounce cans of apple pie filling so maybe try that? Sorry I’m not more help! 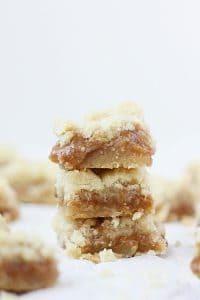 I love super easy desserts like this one! 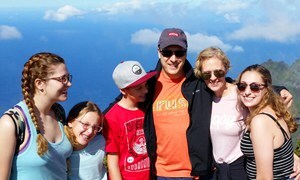 They’re my favorite, especially during the holidays! 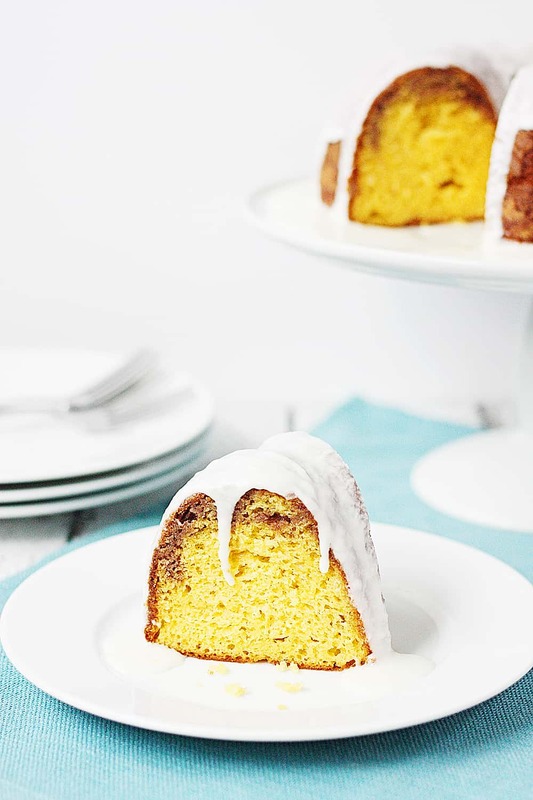 This cake is so easy and delicious – cant get enough! It’s easy to eat the entire pan!